On this webpage, coin collectors can find the best sale prices for 1925 Peace Silver Dollar coins available online. 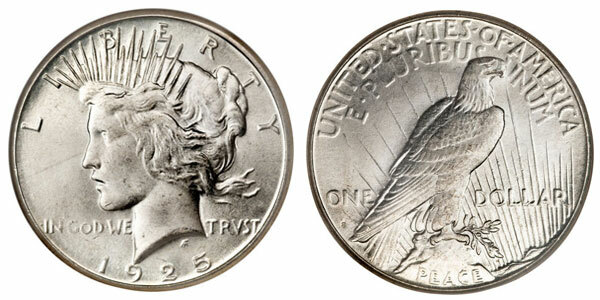 In this year, the Peace Silver Dollars were minted in San Francisco (1,610,000) and Philadelphia (10,198,000). And once again, no coins were minted in Denver. The coins produced in San Francisco will have the "S" mint mark, but the ones made in Philadelphia do not have a "mint marks." The 1925-S Peace Silver Dollar coins have the higher value, average prices ranging up to $1500, depending on the condition of the coin. High quality mints are rare so they command a higher price. On the other hand, the 1925-P Philadelphia mint Peace Dollars cost less with average prices ranging from $25 to $150 on the market for circulated silver coins. 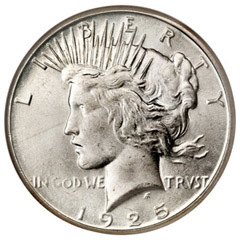 Below we have posted the current 1925 Peace Silver Dollar coin value.